Using the features in Excel to add descriptor data can save you a great deal of time in your mixed methods or qualitative data analysis. Rather than adding a field and manually going through each case to add or edit information, you can make edits and editions via Excel and then re-import your data quickly and easily back into Dedoose…all without disturbing the links to media you have already established. Please hold all applause until the end of the blog! Let’s look at an example using the demo project that comes pre-loaded when you start your free 30-day trial. For this example we will add the field ‘Favorite Color’ to our study. There are some users who have more than one descriptor set in their study. They might be tracking different levels of analysis – participant demographics as well as information on the location of the study etc. If you have more than one set, click on the set you wish to make edits to. You will know you have selected your set when the name of the set is highlighted blue and the proper information is listed in the Descriptors in Set section of the workspace. If you have only one descriptor set, move on! 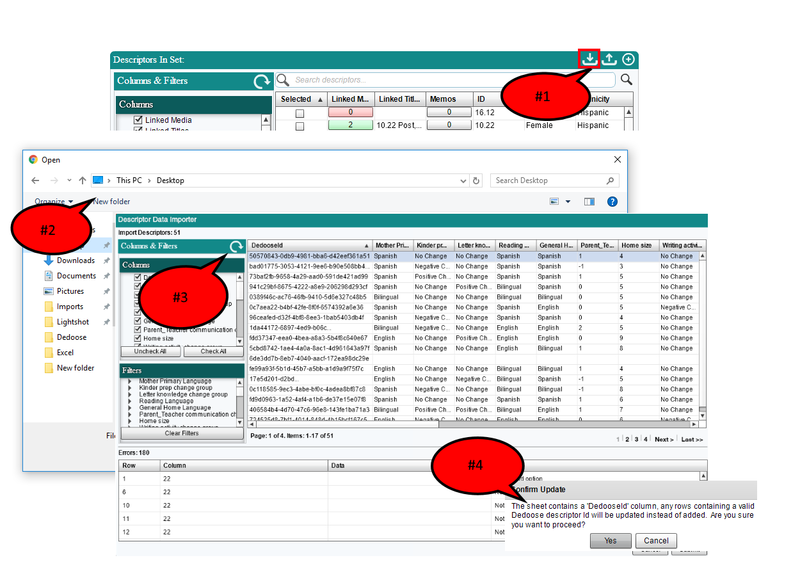 We highly recommend that you us OPTION LISTS as often as possible so you have control over the grouping of your data. If you do choose to use continuous variables, Dedoose will use an algorithm to auto-group these data points so they can be best represented in charts and graphs. It is typically best for you, the investigator, to create meaningful cut-points in option lists instead. 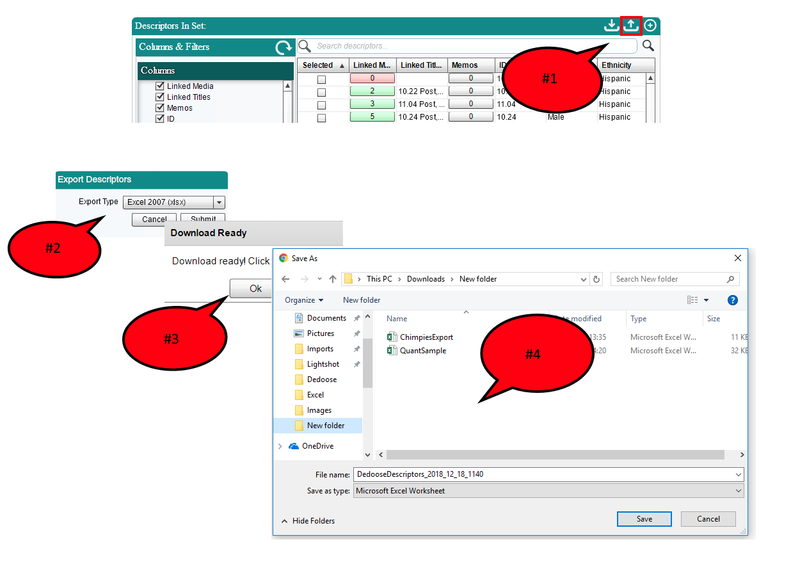 To export this data click on the button that looks like an arrow pointing upwards in the Descriptors in Set section of the workspace and follow these steps to download your descriptors to Excel. Once your file is downloaded, open it up so you can make your edits. You will see something like this: The columns above show your fields, or the ‘questions’ you are asking of your participants. Since you created a new field prior to the export, you will see the column marked ‘Favorite Color’ does not have any data in the rows below. Now – there are a couple things to note here when looking at your Excel worksheet. DO NOT CHANGE the information in the ‘Dedooseid’ column. This is the mapping key that will tell Dedoose how to re-link all your descriptors to your media files. This will not help YOU identify each of the participants…just Dedoose talking to itself. ID field: We always strongly recommend that you include an ID field in your descriptor set. Yet, some people ask, ‘Why do I need an ID field to identify my participants if I have each descriptor case linked to the proper media source in Dedoose?’ Well, the answer is that you might not need an ID field when your data is INSIDE Dedoose. Yet, if you want to make quick changes in Dedoose via Excel you will really want to have that ID field in place so you know which participant is which. If you are walking through this process in your own project and are thinking – ‘whoops…I did not add an ID field,’ you will not be able to use this Excel process effectively. Go back to Dedoose Descriptor Workspace and add an ID field, and an ID for each participant. Then, you can go through the steps in this blog. Now let’s add the new data into that ‘Favorite Color’ column. Make sure that the word you list for each participant is the exact same wording that you listed when you created your field. So, in our case, you will see most people love Dedoose Red. Once your Excel spreadsheet is updated to your liking, save it. Now go into Dedoose and import the newly saved Excel back into your project by clicking on the button that looks like an arrow pointing down. Choose the proper file from your computer to upload. You can then review the information you are importing. If there are errors you can go back to correct them and then re-import the data. If you do have errors listed (see #4) it could be as simple as misspelling a word, or including an answer choice that does not match the option list you established when you created the new field. Go back and correct any errors before re-importing the spreadsheet. When you have the import set up correctly you hit submit and you everything will properly link up for you. All done! Always use an ID field for your own reference (so you know which user is which)—you’ll never be sorry to have this unique key and it is critical if you ever need to line up data from different sources. 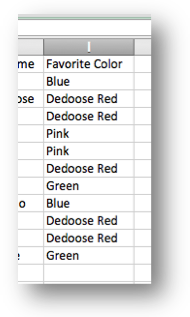 Never change the Dedoose ID, or ‘Dedooseid,’ that is automatically listed in the exported Excel sheet. What other questions do you have about descriptors? Share your questions and examples in the comment box below. As always – continue to ‘Like’ us on Facebook, follow us on Twitter and LinkedIn, and subscribe to us on YouTube. And if you have yet to sign up for Dedoose, you can sign up for your 30 day free trial on our website. Happy Dedoosing!